The night comprised the Union Chandlery June League and the Friday White Sail league and was supported by an entry of thirty one yachts. What a night was enjoyed by all. Light summer wind on the water, brilliant setting sun going down on the club seen through the vista of masts on the marina, savoury aromas emanating from the barbeque on the patio and with Mike Carey’s music echoing around the grounds. Who could fail to enjoy this scenario and it seems this event always comes up trumps. The night was not without its drama when the draw for the engine was taking place using the sail numbers of the entered boats as admission to the draw. The rule is the lucky ticket holder has to respond within the count down of 10 seconds after the number has been drawn and announced. Tension was building as the count was chanted and no sign of anyone emerging from the crowd. Finally, as the moment was drawing very close and competitors thought they might be in with a second chance, there was a scuffling and heaving at the back of the patio dining area and next thing well known and popular Marine Correspondent Tom MacSweeney was seen being aided with a few shoves towards the podium. Bewildered and staggered at his luck he finally reached the point where Rear Admiral Keelboats Kieran O’Connell, watched by Admiral Pat Lyons, was waiting to present him with the magnificent prize. It was wonderful to see his absolute joy and to hear him repeatedly saying “I have never won anything in my life”. Well now he has well and truly made up for this and we hope he enjoys many hours with his superb new engine on his tender flying in out to and from Seascapes. 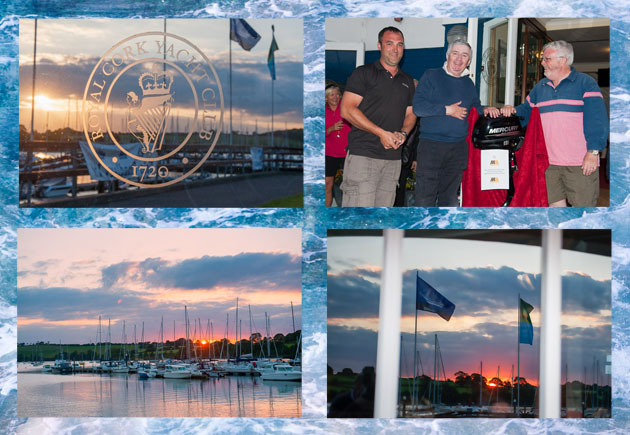 The Club was looking resplendent with flags fluttering in the breeze and looking well with Volvo Cork Week a mere two weeks ago. Another tantalizing prospect for competitors and spectators alike and with a plethora of many well known names and boats having entered the fray.